This is a review of Hydrozole. According to the manufacturer, this product is meant to relieve and soothe the symptoms which occur from the condition known as athlete’s foot. This cream is meant to help soothe irritation, minimize redness, alleviate itching, and also works in the deep layers of the skin to fight the fungal infection at the source. If you are currently suffering from athlete’s foot and wish to learn more about this product, keep reading the review to find out more information. This product does not contain lanolin, paraben preservatives, or any added fragrances. It is recommended that you apply a thin layer of the cream to the affected site and lightly rub it in. You must cover the area that is affected twice a day for up to seven days. In order to ensure the healing process is working, you must be consistent in applying the cream on a regular basis. Do not continue the use of this cream once the seven days of treatment have finished, unless you are directed by a doctor to do so. It is also recommended you allow your feet to breathe during the treatment process. Do not use this product if you are allergic to hydrocortisone or clotrimazole. If you are unsure about your allergies to certain topical creams, always make sure to speak with your doctor before using them. Immediately discontinue use if you experience certain reactions such as swelling, intense pain, severe stinging, or unbearable itching. If you experience any of these side effects or reactions, contact your doctor immediately to get the proper treatment. We could not find a seller for this product. Upon further review and research, it seems this product is known to be a pharmacist-only product. This means that while you do not need a prescription for the product, you still need to have the sale made by a pharmacist. Since it is pharmacist only you cannot purchase this online. If you do happen to find this product being sold online, we would caution that said product is probably not authentic. Since this product is not sold online, there is no information about any type of guarantee for the interested party. Your best bet would be to find a location for the product and see what the pharmacy’s return policy is. We did not find any reviews for this product online. 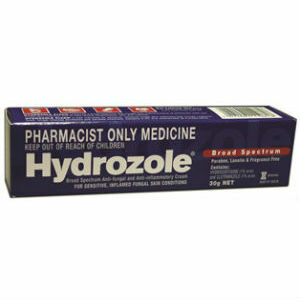 Hydrozole seems to be a solid product since it is almost a prescription grade product with its potent ingredients. The fact that this product is sold by pharmacist only is another factor to consider when thinking about purchasing it. While the ingredients are potent, some customers may find it very difficult to track down and purchase, especially if this is not a popular product in their area. Since it is such a hassle to buy, we feel this product is not ideal for everyone, especially for those who wish to find an effective, over the counter topical treatment without the issue of trying to find a location that sells it. Jimmy Rodriguez	reviewed Hydrozole	on November 19th	 and gave it a rating of 2.5.